This is the first installment on a series of posts we’ll be re-running from The Horse-World of London by William John Gordon (1893), each one chock-a-block full of interesting details. We hope you’ll enjoy them as much as we do! 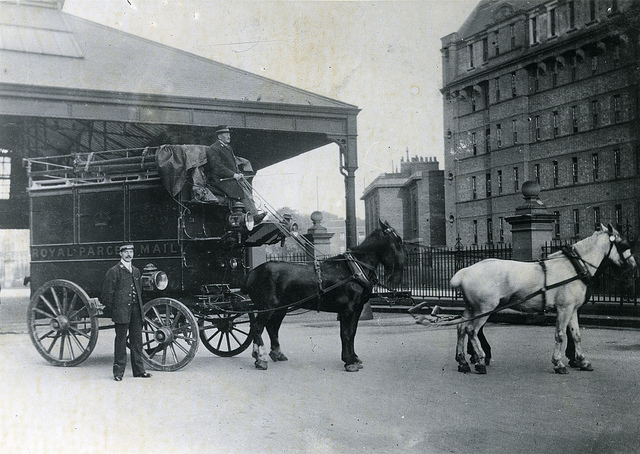 The Post Office owns no horses; it does its work by contract, and McNamara’s have `horsed the mails’ ever since 1837, when so many good things began. They have now 600 horses at their central quarters in Finsbury and the local branches from which the outer ring of postal districts is worked, besides a few hundred others for trade traffic. And out of London there are forty-two horses on the Brighton road working the Parcels Coach, and the twenty-six Tunbridge Wells Coach horses, and the other coach horses; but these cannot fairly come into our census, except as regards those for the first stage out and last stage home —the stages being the ten-mile ones of’ the glorious old coaching-days,’ concerning which we may have something to say presently. The Post-Office horse is always at work. What with ‘mails inwards’ in the morning, ‘mails interchangeable’ during the day, and ‘mails outwards’ at night, and ‘foreign mails’ arriving before their time at all hours of the day and night, and which he must always be at the railway to meet, he has quite enough to employ and worry him. He begins his week’s work at four o’clock on Sunday afternoon; he ends it at half-past ten on Sunday morning; and at any time during that long week he is liable for instant service, and has only five and a half hours’ undisturbed rest. Of course he gets a good deal more as he becomes used to the bustle of the stable, but that is the only respite he is sure of—just enough, as it were, to go to church and digest the Sunday’s dinner. And yet with all this, while the tram horse is cast after four years, and the omnibus horse after five, the mail horse is not weeded out of the service until on an average he has spent six in it. He is generally English, but comes from no county in particular, and costs rather more than the omnibus horse, for we shall be averaging him rather under the mark at 36L; but he is well looked after and has few ailments. It is not often that a mail horse is sick or goes very wrong. At every railway station to which he goes there is a foreman to look after him, and at every stable there is a keeper to every dozen horses, so that he is attended to at both ends, and his keepers check each other to his advantage. And he lives, as a rule, in flats, in an atmosphere of disinfectants and a continual round of whitewashing; so that everything is done to keep him in health, and the result justifies the effort. And he is fed well—indeed, if he were not, he could not stand the work. One of the noticeable things at the ever-extending headquarters in Castle Street is the mixing machine, in which the oats and clover and hay and beans are blended into the general mass which forms the fodder. On one floor the hay and clover are being chopped by steam, the knives, owing to the silex in the straw, requiring renewal every twenty minutes; on another floor the chopped stuff is being poured into hoppers sackful by sackful; on another, oats are being poured into another hopper, beans into another; and all these hoppers communicate with channels and spiral travellers and ingenious mixers, so that in the delivery the blend is even and free from all patchiness—the last stage being when the mixture is shot into a huge bin, the bottom of which is, by a turn of a lever, converted into so many swing-fans, between which the provender falls instantly into the sacks below. McNamara’s not only mix their own fodder, but make their own harness, their own shoes, their own wheels, and even their own carts—for the mail carts are not designed by the Post Office, but by the contractors, and then built on approval. The body of a one-horse mail cart looks n6t unlike a cupboard until it gets the wheels on, but it is rather more elaborate in its decoration, simple as it may seem, for before it gains the royal colour which saves the horse from notice it requires no less than sixteen different coats of paint and varnish. There are 260 of these red carts and vans, and the yard is busy with them and the parcel coaches coming in splashed and thick with mud—the coaches having been out all night, to remain till night, and the carts having most of them been out since four in the morning, and being off again with the change horse. In and out the horses are worked with very little attempt at a hard-and-fast routine, owing to the irregularity in time and bulk of the foreign mails, which forms the great difficulty of the business, and makes the problem to be dealt with that of dealing with surprise trains. The unexpectedness of these is due to the limit being made as wide as possible at the shipping company’s request, in order to save them from all risk of penalty for being behind-hand, and the arrival taking place as far as possible within the limit, for the sake of the company’s reputation. 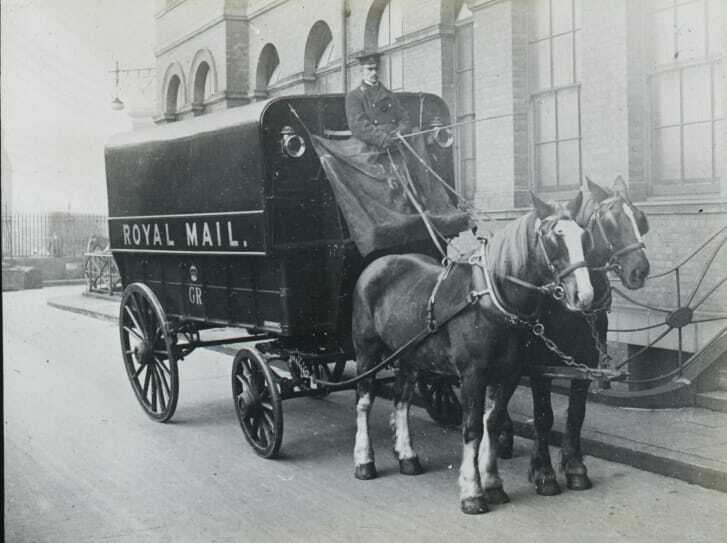 The inland mail that comes to the moment can be provided for as easily as the outgoing mail that starts to its time; it is the foreign mail brought by the record-breaker, and delivered any number of hours before it is due, for which the Post Office horse has to suffer.